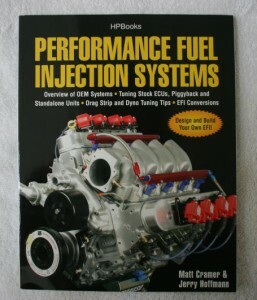 “Performance Fuel Injection Systems” HP1557: How to Design, Build, Modify, and Tune EFI and ECU Systems. Covers Components, Sensors, Fuel and Ignition Requirements, Tuning the Stock ECU, Piggyback and Standalone systems, and EFI conversions. It was written by Matt Cramer and Jerry Hoffman, the owners of DIYAutotune.com, the leaders in Megasquirt and other “do-it-yourself” EFI systems. This book is a must have for anyone looking to get into creating and tuning their own EFI system.